My name is Rowan Allen and I have recently had Abbey Thermalboards applied to my home. I would just like to say that Rick has done an absolutely outstanding job. Rick was an absolute pleasure to have at my home. He is a true craftsman and takes pride in every aspect of his work down to the finest detail. He is very knowledgeable in his trade and has offered low-priced solutions to even further make my home what I want it to be. Rick also has excellent customer services skills and offers great communication. I really felt like I was part of the process. Rick is by far, the BEST tradesman I have had work on my home and I think he is a great asset for Abbey Thermalboards. We would highly recommend Abbey Thermal Boards. We found the salesman, David, very informative, answered all our questions clearly and was most helpful with suggestions re: colour and trim. The installers, Terry and Blake, were excellent, professional and courteous. Terry, a long term employee of Abbey, obviously takes pride in his work and ensures everything is done to a high standard. The end result was above our expectations and it has transformed the appearance of our house. David even called after the completion of the job to ensure we were pleased with the result. Bonus – no more painting! Our new look house looks fantastic and the whole process from quote to delivery and installation went very smoothly. The installer did a very neat job, was fast, very polite and cleaned up the mess beautifully. We have no hesitation in recommending Abbey Thermalboards! I couldn’t recommend Abbey more. David (the sales rep) answered all my questions, came back several times to ensure we were comfortable with the product and to make sure my wife was happy as she couldn’t make the initial meeting. The installers (John and Earl) did an incredible job. They came across a structural issue with my home whilst doing their work. They helped me come up with a remediation plan which delayed them a couple of days. They didn’t mind as they genuinely wanted the job done right. Cladding is expensive however they were cheaper than their competitors and it’s and investment in my home. It looks great and it will pay off in the long term as I never have to paint again! Great to deal with from start to finish, installation was so fast and result looks great! Cost was very reasonable versus painting. I David Smith of Fingal Head NSW had Abbey vinyl cladding attached to my house in 1994. I have been very happy with it’s durability and low maintenance throughout that period. In march this year I had a major fire in my 9×9 colourbond shed 5 meters from my house. The heat was so extreme due to the amount of flammable material stored in there the colourbond shed collapsed on itself. Amazingly the vinyl cladding on the house which was only metres away buckled and melted but did not ignite. I feel many other building materials would have ignited thus destroying the whole house. Once again I’ve been more than impressed with the qualities of Abbey vinyl siding! I internet banked into your account this afternoon on completion of my cladding. I am extremely thrilled with it! I would also like to praise Dean as a young man and as a workman, he really is a lovely person. I am writing to you as I would like to personally thank mike your sales representative and terry your tradesman for the work and effort in looking after my self so well recently. I am very pleased with the professional work that Terry showed over the course of the installation of the thermal boards. I am a very happy customer and will certainly recommend your company to family and friends. Frankly, the whole experience with Abbey has been positive, from first contact, quotation through to installation. The house was completed within the time frame specified and the tradesman on the job couldn’t have been more helpful. The end product exceeded my expectations. The silver lining……I don’t have to paint ever again! I thoroughly recommend Abbey Thermalboards! 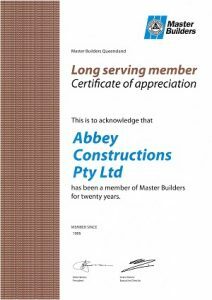 I have utilised the services of Abbey Thermalboards for the purpose of cladding the Wishart Scout Hall on behalf of Scouts Association Qld and found their service exemplary, from the original quotation process followed by ordering and delivery then the on site works carried out. I found each and every staff member that I dealt with personable, professional and most of all courteous and obliging throughout every process or request. I had discovered that most all of the staff at Abbey Thermalboards had been employed with the company for longer than (20) years which speaks volumes why this company is so successful. 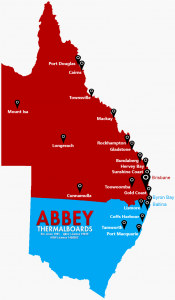 I would have no hesitation in recommending Abbey Thermalboards to anyone looking to improve the aesthetics of their residence or business dwelling. Our results were fantastic and we are currently processing an order for another cladding job for Scouts hall Southport Gold Coast. Commercial Asset Services pride themselves in achieving the best possible result for our clientele and with our association with Abbey Thermalboards, we can be assured that this is maintained to a quality of excellence. Dean has done a wonderful job on my house, he was very professional and courteous and a really good worker. Peter Edwards, who quoted for the job was also very professional and courteous so overall I found dealing with Abbey was a good experience. They were great, followed up with me, did what they said they would and I was really happy with their work. I would highly recommend Abbey. The representative who met with us was very professional. He was not pushy and we felt very comfortable with him. He was happy to call back with more samples and answer our questions. The workmanship of the person who did the cladding was exceptional. We could not be any happier. The person took great care in every detail. His work exceeded all our expectations. Fantastic company – really looked after us through the whole process. Everyone from the office to the warehouse and our installers worked really hard to ensure we had a result we were happy with. The product is great and has totally transformed the look of our house. It is durable, termite proof and never needs painting so is well worth the investment. Special thanks to our installers Terry and Taylor, they were a great team and really lovely to interact with day to day. A genuine and sincere thanks to Abbey from both my wife and myself. Great service from start to finish. Quality product & even better service.